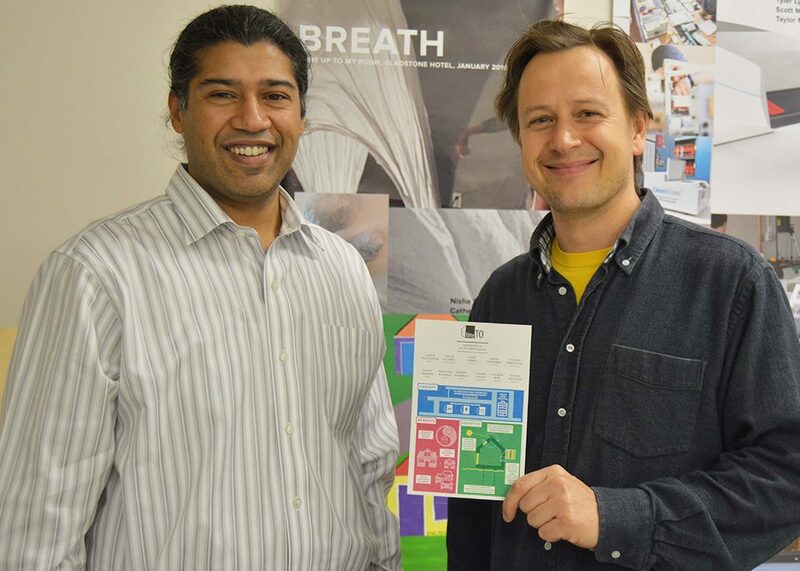 The Design Fabrication Zone (DFZ) is expanding its number of members, projects and recently, in location. The DFZ is going from being cramped into a few rooms on the third floor of the Victoria Building to stewarding a new “future lab” that will be located on the main level of the Church Street development. On Oct. 27, the DFZ hosted their annual open house at their current location. Attendees were able to tour the facilities and get a behind the scenes look at design fabrication projects currently underway. Bessai presented a panel on what the DFZ offers, their current activities and a vision of what the new location could bring. Founded by faculty member Filiz Klassen in 2014, the DFZ currently has around 250 members and 80 projects. These projects vary from installations such as The Bluffs, which were designed as a seating area for Ryerson’s Launch Zone in the Student Learning Centre, to commercial products such as Joyride, a bicycle anti-theft device that uses free public Wi-Fi to track stolen bicycles. Klassen explains that once school is finished, the DFZ will help students enhance their skills outside of the classroom. At the annual DFZ open house, The Ryersonian got a behind the scenes look at two projects that are currently underway. 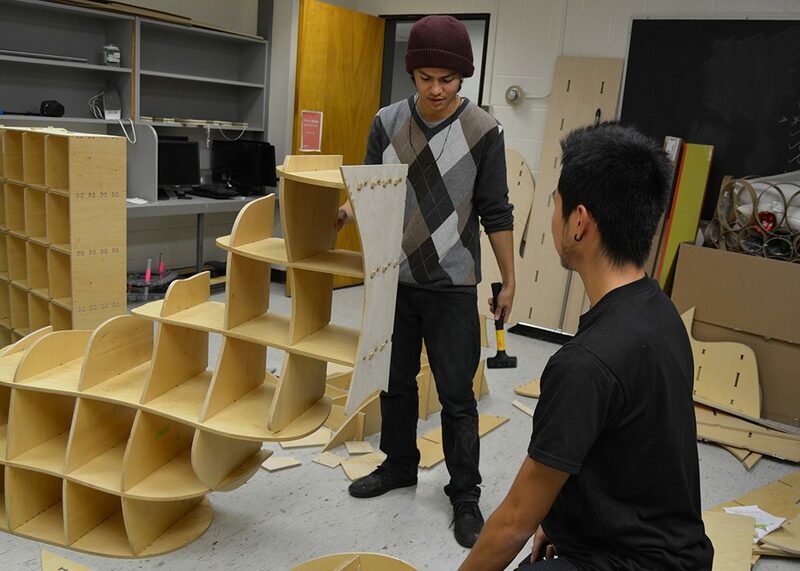 The first project is an installment called “The Digital Media Experience shelving installation.” Two third-year architectural science students, Erik Aquino and Adrian Chîu are creating the shelving installation for the Digital Media Experience Lab – a space on the third floor of the SLC. 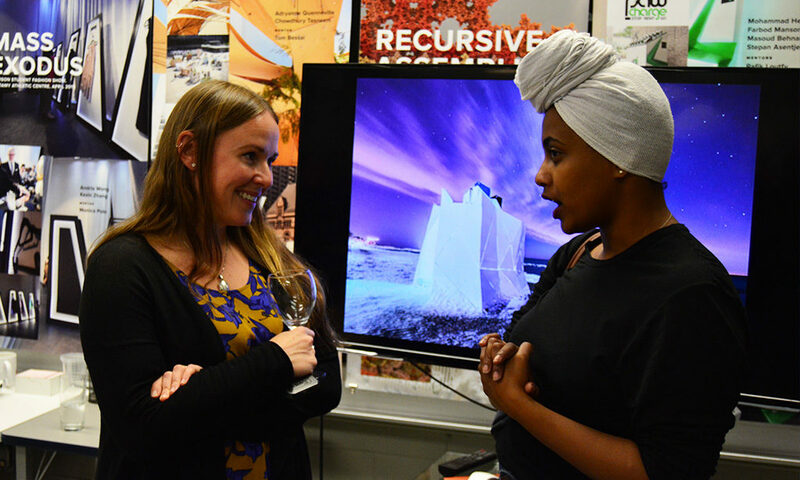 “There are about 40 Master students using that space and as of now, there aren’t many storage spaces for their personal belongings and items that they are using in there. This is going to be an amalgamation of both,” Aquino states. The installation is made out of birch plywood sheets that are stacked on top of each other, giving off a wavy look. The colour will be a mix of raw wood and white paint. The second project is a commercial product called “Tiny Toronto.” The Founder, Sa’ad Ahmed and Lead Designer/Architect, Jacob Antoni have been putting full-time effort into the building systems of this project since last June. The idea is to build tiny houses in the city of Toronto that are affordable and eco-friendly. These tiny houses are mobile and can be placed in backyards of houses that have extra land. Ideally, it’s like having a condo in your backyard. In terms of pricing, a TinyTO would cost 10’s of thousands for a studio and in the 100’s of thousands for a larger size equipped with a kitchen and bathroom. It would be half the price of a condo. These are only two of the 80 and counting projects at the DFZ. With the confirmation of the “future lab” at the Church Street development, young entrepreneurs will have more space and equipment to turn their ideas into reality. The multidisciplinary building is set to open just north of Dundas Street in the 2018 academic year. In the meantime, the DFZ continues to hold workshops, hackathons and competitions to get students involved. Daniela Olariu is a multimedia journalist that is pursuing her BJourn at Ryerson University. She enjoys covering breaking news as well as the arts & life and following news stories that are happening locally and internationally.